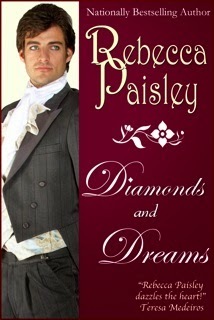 We are delighted to welcome Rebecca Paisley to The Romance Dish today. Rebecca is a former Air Force brat who now lives in the North Carolina woods. She writes charming historical romance with heroines who defy all the 'rules' of the genre. Her books have landed her on the Publisher's Weekly Bestseller list and the Romance Writers of America's Honor Roll. She's also been a RITA finalist and won both the Romantic Times Lifetime Achievement Award and Career Achievement Award. 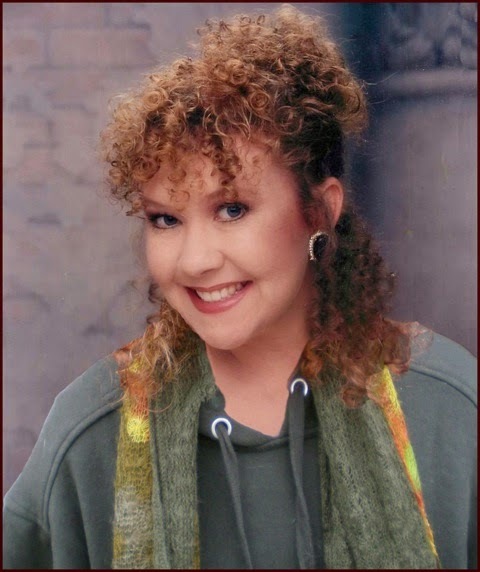 Rebecca's books are currently being reissued by Amber House Books. Find more information about Rebecca and her books at her website and connect online with her at Facebook. Rebecca also mentioned to me that this is her first blog appearance so let's all give her a very warm welcome! Welcome, Rebecca! It’s a pleasure to host you today. Being a long-time historical romance reader, I’m not sure how I managed to miss your books during their first go-around but I’m grateful to Teresa Medeiros for introducing me to them now. I haven’t read THE BAREFOOT BRIDE yet but DIAMONDS AND DREAMS kept me up reading way past my bedtime the other night and left me thoroughly charmed. Will you please share with readers what they can expect from these two books? I’m charmed that you’re charmed! And I do mean that. Even after having published a myriad of novels and novellas, it’s still a bit astonishing to me when readers say they have enjoyed my stories. I mean, it’s really an extremely wonderful thing, the opportunity to place your musings into another person’s hands. That person can hug your story or throw it down. I’m always nervous over the process because I’m sometimes not able to temper some of the more outrageous ideas that come to me. I try to keep an extensive variety of personal tastes in mind while I think and write, but my imagination is more of a separate entity rather than a part of me. It looks like a swirling ball of glitter to me, really, and sometimes I have to chase it all over everywhere, strain to see it in really dark times, or shove it off my pillow so I can have a precious bit of sleep. DIAMONDS AND DREAMS, THE BAREFOOT BRIDE, and all my other stories are about how completely powerful love is when allowed even a fraction of a chance. There is so much hurt in the world, so many emotionally wounded people. Personal feelings are sometimes difficult to name, much less soothe. Some people have thick skins and can soldier on, giving no outward sign of their pain. Not me. Good Lord, just look at me in the wrong way and I grieve myself to pieces. Like, with wailing and face buried in the crook of an elbow. And locking myself away in a shell until I can bear to come out. It’s ridiculous, but I don’t know how to be any other way. And I think that that side of me is what led me to begin writing as a child. I’ve never known what else to do with so many feelings. So they’re books now. Sometimes the feelings are in people, sometimes they’re in a setting, and sometimes I just sort of dance around them and trust the reader to sense that they’re there. And then I set to work devising ways that Love can find and hold them. This is serious stuff and could become too sad. And who wants to read pages and pages of sorrow? That’s when my imagination comes hurling around like a disco ball on steroids. It loves to laugh, my imagination does, and its sense of fun presents itself in dialogue and specific situations. And outward appearances as well. Humor brings such beautiful healing. Outlandish humor causes the bursts of merriment so needed by both real people and story people. And it works best when it’s unexpected. The lead-up I use for that humor is subtle. In this way, I am able to smack the reader suddenly so s/he hesitates for an instant, unsure where the sadness went. And then I hope the reader will feel that burst of laughter that is so important to the kind of stories I write. It’s a manipulation of emotion, and it works because Real Life also toys with our emotions. As an author, I merely embellish and “bigger” what readers are already very capable of feeling. That burst of laughter is certainly present in DIAMONDS AND DREAMS and I was delighted by it! Goldie – the heroine of Diamonds and Dreams - is not the type of heroine most people would expect when picking up a Regency romance. What inspired you to write this type of character? By the way, I found her to be an absolutely delightful breath of fresh air! Out of tortuous desperation, I patterned Goldie Mae after my own self. I had been trying to come up with ideas for my third book when my editor at Avon Books called to ask if I could have the book done in 90 days. Avon needed to fill an empty slot in their schedule right away. Before that call I had had about 8 months to write my book. I was hysterical with fear, a thousand percent sure I could not do it. But because I am bereft of the ability to say no and due in no small measure to the capricious nature of my imagination, I said I would have the book done in the 90 days. And then I stared at my blank computer screen for over a week, and I didn’t even eat during those scary days. Before Avon’s request, I had already decided the book would be set in England and feature an American heroine. That’s about all I knew. So how in the dang world was I going to characterize the story people and think of a plot that would carry the book for almost 500 pages? I hadn’t even completely researched England and British ways! Imagination took me firmly in hand, and Goldie became a heroine who knew nothing about England or the British people. Because I didn’t know about England or British people. It’s the only thing that made sense to me. To use my own ignorance! I wrote down and pondered every naïve thought I’d ever harbored concerning English royalty, aristocracy, traditions, manners of speaking, ways of dressing, etc… And all those really dumb notions I had went into Goldie. Some of them came from my childhood. I used to think that English money was counted in pounds. Literally. You weighed your money to see how much you had, see. And I had it in my mind that dukes probably turned their noses up at a lot of things, which led to Goldie’s belief that dukes most certainly sniffed a lot. I sprinkled things like that throughout the story both to characterize Goldie and to make the hero’s life miserable. I do love to create heroines who sorely try their men’s patience. And I have this wild curly hair that I’ve spent half my life trying to tame, to no avail. So Goldie had to have that hair too. And I’m not tall. My feet don’t touch the ground when I sit in most chairs, so Goldie had to be little too. And I possess a deep love for very quirky people, so Goldie’s many stories about the people she knew in America were, for the most part, people I know. I get my feelings hurt easily, so Goldie’s feelings mirrored my own. Then I put this little Goldie Mae in a plot that would showcase her ignorance and tender emotions, and I gave her a hero who wasn’t sure what to do with her. Never forgetting my own childish beliefs about England and British people and ways – and allowing my imagination to do what it would - I wrote the book in 90 days. If that's what happens when you write a book in 90 days, I think you should do it more often! One of the things that I most enjoyed about Diamonds and Dreams is that it made me laugh. Why is humor an important part of your writing? What are the things in life that make you laugh? As I said before, I do rely on humor to hold on to my reader. I don’t know anyone who doesn’t like to laugh. And I find the most humor in people and situations that are exceptionally odd. I work very hard to create heroines who are not normal. I don’t like conventional things, and I have always been drawn to people who don’t even realize how unique and funny they are. One time my realtor aunt got a call from a man named Irk who wanted to sell his house. It wasn’t until he signed his name on something that she realized his name was ERIC and that his very southern drawl had made his name sound like IRK. See how something so simple can be so hilarious? THAT is what I look for and weave through my stories. Humor like that is everywhere, all around us. Some people might not notice it until it bashes them on the head. I like to do that kind of bashing. It makes ME laugh. And sometimes the fun things come from situations rather than characters. In A BASKET OF WISHES my heroine is a fairy. She shifts to about the size of a thumb when she runs out of energy. In one scene, she shrinks in front of her hero, who is in bed. In the next moment we see her tiny self doing a sort of Irish jig on her hero’s . . . Umm, well, near the part of him that makes him male. His gasp of surprise and the look of disbelief on his face made ME laugh. I just couldn’t imagine such a sight, really. A tiny fairy tap dancing on a man’s parts. Even though I was writing the scene myself, I was laughing because it was just so preposterous. I love it when that happens. It’s serendipity at its finest. Are there plans to reissue any of your other previously published books - specifically A BASKET OF WISHES? After the visual you've given us, I'll be downloading this book the moment it's released! Yes! My new publisher, Amber House Books, is bringing out my backlist! I’m excited unto death. I have found so many of my loyal readers, and I am now discovering a lot of new readers too! It’s almost like the books have never been published before and are just now being released, brand spanking new. It just tickles me to pieces that my stories are still making people laugh. And cry. You have to have a few tears in order for the laughter to feel so totally wonderful, y’know? Yes, I do know. I do a lot of both! You and I share a love of animals, a love clearly also shared by your DIAMONDS AND DREAMS heroine. Please tell us about the animals who share your home and the role they play both in your life and your writing. I don’t ever remember not having animals. My first was a black cat named Spooky. Original, huh? Most all of the animals I have owned or known have somehow made their way into my books. Goldie Mae’s horse, Dammit, was a real horse belonging to my uncle. Dammit was his name. Itchie Bon, Goldie’s mutt, was a poodle we had when I was little. Nehemiah, a cat you will meet in RAINBOWS AND RAPTURE, was a real cat. He had a billion nicknames. So, of course, in the book he has a billion nicknames too, which annoys the hell out of the hero, Santiago Zamora. I wouldn’t be happy without animals surrounding me. And so I can’t be happy if they aren’t in my books either. They are real characters with real personalities. I do so hope readers are touched by my story animals, just as I hope they and other people do what they can to help real animals in Real Life. This is a subject so dear to my heart that I can hardly write about it without tearing up a bit. Having been involved in Animal Rescue for many years, I have seen the worst and the best of mankind regarding animals. I want to believe that MOST people possess the kind of goodness needed to protect animals, all animals. The message to spay and neuter and ADOPT is more widespread than it used to be, but we still have a long way to go in the fight for critters. No kind gesture, however small, goes unnoticed by a needy animal. And God bless every person who has ever helped a little beast. Or even a big beast or a finned or winged one. Ha! My son used to gather up earthworms that had been washed away in rainstorms. He’d find them on the street and bury them back into the ground. I used to tell him we wouldn’t have any dirt without the worms. From worms to elephants . . . they are all precious. Many of us have our comfort reads, those books or authors to whom we turn when our spirits need a lift. Who are your “comfort read” authors? Comfort books are those that make me laugh. I want to be entertained in an amusing way. When the writing fever is upon me, though, I cannot read fiction because I am so afraid I will copy another author’s words or thoughts without meaning to. And sometimes another author’s brilliance will make me feel like the worst writer in the world. Then I can’t write at all. I read a lot of history books. Research books. Sometimes I use the research in a future project, and sometimes I just like to think about it. I found a bit of true trivia once that turned one of my books around. A very long time ago, this man was trying to turn metal into gold, but he only ended up creating a substance that glowed in the dark. I read that and tucked it away to think about another time. About a year or so later I needed that exact bit of trivia to write myself out of a corner in MOONLIGHT AND MAGIC. It worked so well that a lot of readers thought I’d made it up. But it was a true thing! One of the reasons I enjoy reading historical romance is that it allows me to step away from the challenges of everyday life and lose myself in another place and time. If you could step into the shoes of any fictional character who would you choose and why? I would definitely be a maiden from long ago and far away. My house is filled with paintings of maidens, most all of them painted by Pre-Raphaelite artists. I have life-sized knights in armor in my home, and I have medieval-looking dresses I love to wear. I like to pull my hair into this golden snood I bought online. I don’t care for things that are really contemporary. I love old things. Antique furniture, “ancient” jewelry I make myself, and even rocks I come upon. I found a little rock buried in the wall of the Colosseum in Rome some years ago. I didn’t try to tear down the wall to get it; it was already loose and kind of falling out. I love that rock. I love imagining all the things it has seen since its wall was first built. Any centuries-old maiden would suit me quite well! My friends and family like to poke fun at me over my days of yore clothing and furnishings and other notions, but so far I have not been swayed to change what I love the most. According to your Amazon bio, you’re currently working on a new book. Are you at a point where you can share anything with readers? I actually have 3 books started, but I finally decided which one to finish first. There are many, many animals in the story. And lots of mystery and magic. I can’t explain too much of the book because then I will feel as though I have already written it. But suffice it to say this story is making me very happy, and I hope it will do the same for readers. It is fanciful, but it is also a dream that I have hoped is true since I was a little girl. In my book it is very true, and that’s what makes me so happy! Thank you so much for visiting with us today, Rebecca. Would you like to ask our readers a question? I’m so happy to be here with y’all. I’ve really enjoyed answering your questions and, while answering them, I even thought of a new book idea! I’ll have to dedicate that book to The Romance Dish when I finish writing it. J Thank you so much for that! For readers: Has anything magical ever happened to you? If so, what was it? I so enjoyed this delightful post. What a wonderful author and such an interesting interview. Magical, yes, since life is always such a road filled with ups and downs which test our strength. When I walk in the foothills it is magical since I see so much of nature which is always inspiring. Hi, traveler! Thank you so much for coming and being my first comment person on my first online interview! I do hope you continue to enjoy your magical foothills! Traveler, I so agree with you on foothills. I spent many years living in the foothills of the Blue Ridge and they are indeed magical. I lived in the Blue Ridge while in school, traveler and PJ. I went to Appalachian State University in Boone, NC. Some of the people I met in the smaller surrounding towns and other areas stayed in my thoughts for a very long time and eventually became the first, tiniest, pulsing idea for Chickadee McBride in THE BAREFOOT BRIDE. Mountain people of today are not really like her, of course. She's an historical heroine, and I dressed her up in speech and mannerisms to fit my story. But there are a great many things about her and her ancestral background that are, indeed, based on fact. Her mountain dialogue really IS the closest thing to Elizabethan English that we have today. Chaucer would have been able to converse with her and not had a bit of trouble! I'm so happy your books are back in print! Y'all. I became so emotional when I first saw these stories in paperback form again. (Really, Beck? YOU? Emotional? Surely you jest!) I mean, to hold my books again. In my hands. It seemed a religious moment for me, and I think it was. God's name in DIAMONDS is The Dream Giver. And I believe The Dream Giver has a great deal to do with many things that are happening to me now. I and my publisher, Teresa Medeiros, write "TDG" in a lot of our emails when we talk about Him. To say I am happy to see my stories come back to life in both paper and in digital format doesn't come close to how wildly ecstatic I am! I enjoy your humour, it's so fun to see how your characters get in and out of trouble. When I see your name I always know it's going to be a great book. I'm headed to get one now, they never get old. Thanks for stopping by, Mimi! I'll be loading my Kindle with all of Rebecca's books as they're reissued. Oh, thank you for saying my stories never get old, Mimi! I do try to think of things that will stand the test of time! So good to enjoy your humor once again. That humor is what keeps me reading you time after time. If a person looks, there is something magical every day in life. If a person looks, there is something magical every day in life. If only everyone had that attitude! I love to laugh too, Debbie! There is something MAGICAL about laughter, to my way of thinking. I mean, even little babies who don't talk yet will laugh! What are they laughing about? They feel happy, and they laugh. I can understand more when they cry and scream from hunger or a wet diaper or over something that has startled them. But how do they know to laugh? Laughter is a magical thing the world needs more of! Hi, Rebecca! You are a new author for me. I loved your interview and the fact that there is a good sense of humor and animals in your books. I'm definitely going to check your books out. The only thing that I can think of besides the magic of loving and being loved by my beloved husband of 39 years and the magic of living and going to magical places, is the fact that as a child, I saw a ghost one night. I was absolutely terrified! I realize now how special of an experience that was. Cathy, will you share your ghost story with us? I'm fascinated! Maybe you saw an angel, Cathy! Or, whimsically speaking, a fairy! And maybe we don't even have to nail down the definition of magic. We could just love it whenever it happens to us, no matter its name. And I do hope you enjoy my book animals. So many of them are real animals I know or have known. The only time in my life I have been without animals was when I first got married and moved to Mexico City. I was so sad without them. So miserable, really. My husband worked all day, I stayed home, didn't speak a word of Spanish, had no friends, no one to talk to . . . One evening my husband arrived with 2 mewling, squirming things, kittens his mother had found abandoned near the place where she worked. They were too young to eat by themselves, so I bottle-fed them. Er, dropper-fed them because I never did find a kitten bottle for them. A vet in Mexico made up kitten formula for me since that wasn't for sale anywhere either. I named my new fur children Nicholas and Prometheus. Not long after I weaned them we got a mutt puppy. Bernie. Finally, I had company to talk to in Mexico. Finally I was no longer alone in our little apartment. Nicholas, Prometheus, and Bernie never did learn Spanish. They only spoke English even though they were Mexican nationals. Since then I have had dozens of critters and worked many years with Rescue. Adopt, adopt, adopt, y'all! Save homeless animals. It's just the MOST wonderful thing any animal lover could ever do! Hi, PJ and Rebeca! I was probably 5 or 6 years old and was spending the night with a friend down the street. Donna had told me she had seen a ghost but I didn't believe her. That night, the ghost did come to us. If I recall correctly (many, many years ago), the ghost was a little girl that had a white shinnery light around her. She didn't speak to us, but just stood there for a minute and then disppeared. Neither Donna or myself ever saw her again after that night. Rebecca, I have had dogs all my life (usually 2-3 at a time). Both my husband and I loved our babies, as well as the dogs we had while growing up. They have always been our children since we were never able to have any of our own.. We adopted quite a few dogs. I love your story of your kittens and mutt puppy. The only time my husband and I were without dogs was when we first married and lived in an apartment. We were married for 5 months before we got our first dog. I've loved each of your books from the first time I read them, and now I get to enjoy them all over again and again. My life is full of magic and many blessings, I believe that sprites are making my lights flicker, my doorbell ring when no one is there, and a music box starting up on its own, so many magical moments. Hi, Mary Olson! You wrote that sprites make mischief in your house. Isn't that the most awesome thing!? I would really like to hear your music box. My aunt had a spirit living in her home here in NC. Part of her house was very old, dating back to before the Civil War. The spirit's name was Mr. Goldsmith. He liked to flush toilets at night, and he also enjoyed taking out and eating bread and pickles. My aunt had to clean up his messes when she got up in the mornings. Some ghost professionals say spirits don't eat, but Mr. Goldsmith surely did, yes he did. I'm liking the word play between SPRITES and SPIRITS. I like to think the similarities of certain words like that are not accidental. They exist because there is a true connection between them! Love your interview, I am new to your books, have read reviews and excited to read the first, hopefully will be adding you to my list of favorite authors. I love historical romance, and to me these books are magical to take me back in time. Looking forward to many more books. I'm new to Rebecca's books too, Linda but it only took one to have me hooked! I love new readers, Linda! Well, I love them, but then I also get panicky while wondering if they will like how I write. I never could get my skin to grow thicker even though so many people in the publishing industry told me I should. Welcome to my Story World, where things usually happen without my permission or knowledge. It is a very strange thing when you have been writing and then you rest for a bit to study what you have written...and you see lines and paragraphs that you don't even remember creating! That flashing disco ball goes spinning around the room, and really, you could swear you hear pixie giggles from... Well, you know not where. It's best not to question Imagination, I reckon. It's going to do what it wants in then end anyway. I'm delighted that Rebecca Paisley's books are being reissued and particularly pleased that A Basket of Wishes will be available again. I think romance fiction is magical. Just think about the complicated process of learning and using a language and then using that language to create and people a world to which others who have also acquired the language can retreat and, for a sliver of time, forget the pain and grief and worries that plague them and inhabit a world in which happily-ever-afters are guaranteed. That's a magic I have cause to be grateful for every day. Ditto your second paragraph, Janga. You expressed it beautifully! Wow, Janga! Will you pen my next book for me? You write like a master! I loved reading your comments. And you are so right, too. Love IS magical. "The most powerful magic in all the world" says the King of Fairies in A BASKET OF WISHES. His name was King Wisdom. And just think - Love enjoys its very own genre in the book world! A huge genre ruled by Love. That is a very comforting thought to ponder. Equally delighted, Apryl! I'm so happy you are here! I love your books keep on with your wonderful writing. As for the question the only thing magical is being mother to my three wonderful boys. I would say being a mother ranks high on the list of beautiful and magical things! It's so amazing how instantly you love those newly-born little strangers. I have two children. They are grown now. But when I am with them I still feel this overwhelming urge to pick them up, cradle them in my arms, and smush kisses all over their faces and necks. I wish they could be babies again for just a few minutes so I could still hold them like I used to! What a wonderful interview!! Thanks for stopping by and sharing!! I do enjoy your writing!! Keep it up!! Thanks for dropping in to say hello! Thank you for liking my writing! I will endeavor for all it's worth to keep it up! My favorite books are ones with humor. I find magic every time I read a well-written book! The first book I ever wrote was void of all humor. It was So Serious. I wrote it like that because I thought that was the kind of book editors in NYC wanted. Most all of the romance novels I had read were serious ones, very dramatic. Well, I never sold that book. Got about 25 or so rejections from both editors and agents. So I decided to write a different kind of book and NEVER show it to anyone. I had little faith in my writing abilities the after so many rejections, so no way was I going to let anyone ever see my work again. I began to create the kind of heroine I wanted to see in a book. A wild, funny girl who didn't know what a rule was. An outrageous heroine who made me laugh and wonder what on earth she was going to do next. She became Chickadee McBride in THE BAREFOOT BRIDE. I tossed away everything I thought I knew about writing while I worked on that book because, after all, no one was ever going to see it anyway, right? Well, when I finished the story I kept looking at it. And looking at it. And wondering. And then I happened to join Romance Writers of America, and my new writer friends encouraged me to enter The Golden Heart contest. Off Chickadee McBride went. Her first view of the real world! 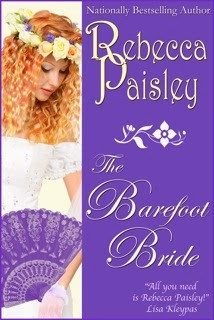 Avon Books soon bought THE BAREFOOT BRIDE. I remember my editor there tried to soften some of Chickadee's more outlandish ways. I tried to help her. But we both quickly realized that this was a heroine who was who she was. She broke so many romance novel rules, but there was no changing her. Just like there is no changing who you really are, how your heart works and feels. Chickadee taught me a very precious lesson. Don't copy anyone - like I had tried to do when I wrote my first book, the one that never sold. Be yourself even if some people don't like you. If you are extremely quirky, be extremely quirky. If you believe fairies might live under the pile of big stones you dug up in your backyard, believe in them. (Yes, I dug up some very odd stones in my backyard and, yes, my heart immediately decided they sheltered some pine forest fairies.) It's really ALL RIGHT to be who you were meant to be. You are not here to decorated anyone's world but your own. the most magical thing that has ever happened to me was when I flew over Ireland for the first time. When I looked out the plane's window, I truly felt like I was coming home. That to me was magical. Catherine, I felt the same way on my first return trip to Florence, Italy. Magical! HI, Catherine! I hope I can go to Ireland one day. And Scotland. I did feel a lot of magic all around me when I was in Italy. Like you, PJ! It was like no matter where I looked I could sense so many mystical things. Felt that same sort of magic when in Spain and England too. I want to go back to Europe one day! One magical moment was looking into my new-born baby's eyes when my first son was born. Also sometimes when I read a book I am transported into it. Anne, I can't imagine a more magical moment than that. It really is a magic like no other, looking into your babies' eyes. So full of brand new wisdom that perhaps we, as adults, have forgotten. Going to Disney and seeing my girls faces when they met the princesses and just looking at Disney through their eyes. I also want to say that I have loved your books for yours. I have the old cover books on my keeper shelf. When I read my first one - Basket of Wishes - I immediately started collecting the others. I love Disney but there's nothing like viewing it through the eyes of a child. Forgot to say - love the new covers! Teresa Medieros at Amber House Books designed those covers. I have not tired of staring at them. And I just got a glimpse of the next cover - for RAINBOWS AND RAPTURE. Oh, it is so striking! It features Santiago Zamora, who is my favorite hero of all the heroes I have ever created. Teresa is amazing! I enjoyed the interview and I especially like the sound of your books. As to magic - I think as long as you believe in it, it is there for you everywhere - you just have to pay attention (that's the hard part lol). It could be something as simple as hearing a bird sing or a purring cat. And books, most definitely books!! Believing is the most important part, I think. You are so right, catslady! Wonderful things happen everywhere, all of the time. It's up to us to be open to them. Happy to learn there will be reprints of your books. As to magical moments, the birth of my children would be at the top of my list, followed by grandchildren and great-grands. In my travels, the magic of setting foot on Irish soil was so emotional, I burst into tears when I got off the tour bus. The tour guide told me it was a sure sign that I had an Irish soul. Thank you so much for introducing me to Rebecca and her wonderful books! Thank you for popping in, Terri. And thank you for inviting me to join Amber House Books. I am so happy! Thanks for the interesting interview. I am not familiar with Rebecca's stories but they look great. I do like stories that have animals in them since we spoil ours so much. Animals deserve to be loved to pieces! I hope you like my books if you read some of them, Maureen! Thank you for coming by. Hello Rebecca! I, too, am an Air Force "Brat" and now a military wife (key support spouse). I am an avid reader of romance, a contest judge with RWA subchapters and I review books as well. I would love to read your stories! The covers are intriguing. Your view of life of "laughter" - that's me, too! Laughing is one thing I LOVE to do, especially with my students. Anyhow, thank you for blogging. Many happy future stories are wished for you. Lovely interview! I would love a chance to read these stories. What is magic? I think magic would be a feeling. I would say my family is magic. Also when you're a starstruck fan meeting a celebrity, or author or a person you've admired at a convention or just by coincidence or happenstance, memories that are made are very much magical. It's magical to meet readers too, kelad! I always feel such awe when I meet someone who has enjoyed my stories. It just never gets old. Ever. I'm so happy you came to this interview and shared your own magic here. Thank you so much! I haven't read Rebecca's stories yet - Thank you for the introduction! Can't think of anything specific, but life can be quite amazing and family connections are quite magical. Hello, Di. Thank you for popping over for a visit. I do hope you like my books if you get the chance to read them! I haven't read any of her books before. They sound good. I have not had anything magical happy to me yet but there is still time. Thanks for sharing your books with us. Hi, Quilt Lady! I hope you experience some magic soon! Even us meeting here and being able to chat together online is a sort of magic. And it's always really magical when you look up at night and see that glorious moon. I love the moon! Thank you for coming to my interview! My grandmother was magical. She live to be 103 and her stories always amazed me. I miss her greatly. Hi, Sharlene! :) :) You should write down all your grandmother's stories! Wouldn't that be something?! I'd like to hear some of those myself! I bet they're just as magical as she was. Thank you for coming here, Sharlene! Hello, jcp. Thank you for coming here. I hope you like my stories and all my wacky heroines! Rebecca, thanks for being our guest today. I hope you had as much fun as we did! What a great interview! Goldie sounds delightful and so does Rebecca! I really enjoyed reading the description of your similarities with Goldie and how you got your book written in 90 days! Amazing! I am looking forward to reading your books. Best wishes! Best Wishes to you as well, Katherine. I do hope you enjoy Goldie and Saber's story should you soon read it! Rebecca, Humor in a story is important to me. It is necessary part of life that we see little enough of. I love that your characters have a quirky twist from the usual. Tried and true has its place, but becomes mundane after a while. Something out of the ordinary gets your attention and perks up the senses. A great imagination is a bonus for the person who has it and those of us who benefit from it. Keep on writing your stories. I love not knowing just what to expect. I will most definitely be looking for your books. Wow! I wish I could have been there in Ft. Ticonderoga that magical night! I got all shivery reading your post. :) Thank you for sharing that, librarypat, and I do hope you like my books if you get the chance to read them! I see you live in the woods of North Carolina. Would that be in the mountains or towards the coast? We have a wonderful bookstore in Asheville, NC, Malaprop Bookstore, that often has author visits and signings. Have you ever been there or will you be there in the future? We live just over the mountain in TN and it would most likely be the closest I would ever get to a signing. Hello again, librarypat! I went to school in the Appalachian Mountains - Boone, NC. I live in Southern Pines, NC, which is in the Piedmont. I do love to go the mountains and do LOVE Asheville! One of my favorite towns in the land. I don't have a signing planned there right now, but if/when I do arrange one I will try to promote it on Facebook, Twitter, and my webpage. I will certainly keep Malaprop Bookstore in mind! I actually love TN, too. Wonderful state! The most magical thing that has ever happened to me was the birth of my son. I think there has to be a bit of magic in that whole process of making another person, and I feel lucky that I was able to experience it. Oh, I so agree with you, Barbara! Making another person... It doesn't get more magical, awesome, or holy than that! I love unusual and humorous books, so I'll be checking out your backlist when they're re-published. I love that you love unusual and humorous books, Anonymous! And I believe some magic is happening right around her. Maybe it just hasn't tapped your shoulder yet. :) Be on the lookout for airy glitter seemingly from nowhere! Pixie Dust!